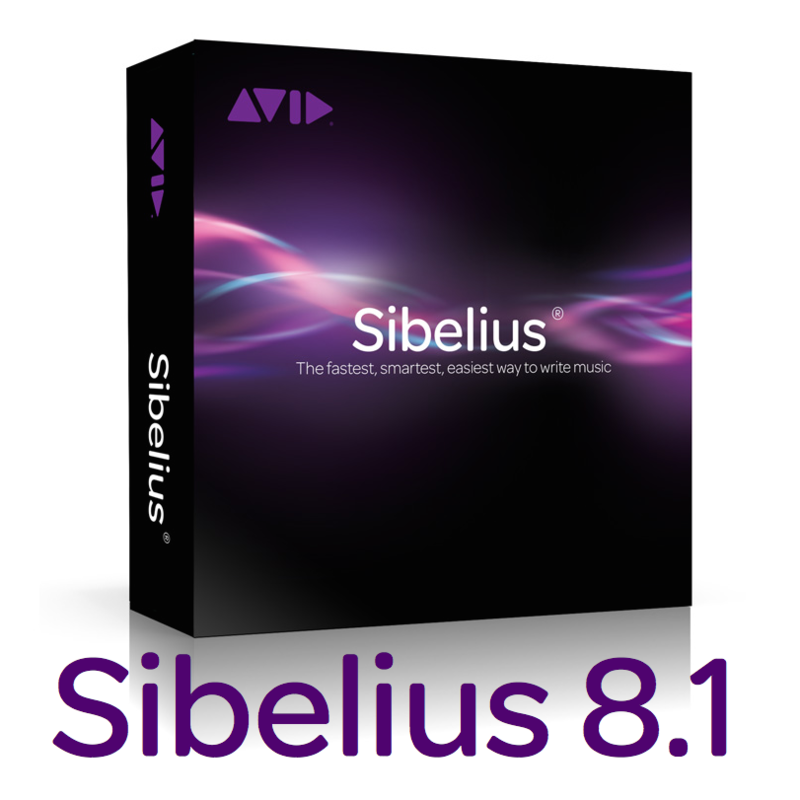 Today at the NAMM show Avid announced the release of Sibelius 8.1. A free update for most users already using 8.0, Sibelius 8.1 adds a handful of new features, including rests that avoid notes in other voices; exporting directly to MP3 format, and repeat ending lines (such as “1.” and “2.”) that are placed correctly by default. Other improvements include better trackpad support on Mac and official support for Mac OS X El Capitan. Performance improvements and bug fixes round out the list of changes. The major new engraving feature is the handling of rest placement, so let’s begin there. Rests that automatically scoot out of the way of a note in another voice has long been a top wish-list item, not only for Sibelius users, but for Finale and MuseScore as well — none of the programs had the ability to intelligently position rests according to context prior to today’s Sibelius update. It’s actually quite a challenging problem. Collision avoidance is the most basic element of the solution, but for readability’s sake, you don’t want rests that go all over the place. So the rests must also be aware of their surrounding notes as well. The screenshot above shows the default options for scores newly created in Sibelius 8.1. For scores created in earlier versions, Rests avoid notes in other voices is switched off, which disables all of the other options. Rests avoid notes in other voices is the most basic option. This is simple collision avoidance – rests avoid colliding with notes in other voices. When you think of all the other collision avoidance already built into Sibelius since the Magnetic Layout feature was introduced, this fits naturally into that concept. Notice how, in bar 2, the rest on beat 2 is also avoiding the time occupied by the half note. So maybe it’s best to think of this as not just collision avoidance, but time-space avoidance as well. In voice 2 of bar 2 of the above example, the half rest on beat one stays up because it is not part of the beam group (four eighth notes in this case). The quarter rest on beat 3 is pulled down by the low G on beat 4. In bar 3, the quarter rest on beat 4 is pulled down by the low A dotted half note, because its value of three beats extends into the next beam group. In bar 2 of the above example (voice 2), there is no intervening note in the first beam group, so the half rest gets pulled down to align with beats 3 and 4 of the bar. In bar 3, the E quarter note on beat 1 determines the position of the quarter rest on beat 2, and the low G quarter note on beat 4 determines the position of the quarter rest on beat 3. 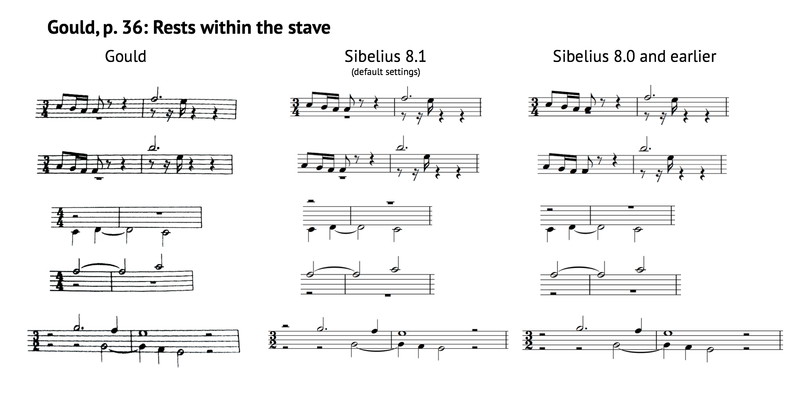 Finally, if Rests continue in same vertical alignment until writing in single voice is checked, Sibelius will take the position of the rests in the most recent bar into consideration when writing rests in subsequent bars, until music with only one voice is written. See how the position of the whole rest in bar 2 in the above example is different. For rests that fall between groups of beats, Sibelius will interpolate the position of those rests to create a path for the eye to follow. The effect varies depending upon which of the options are selected in the Engraving Rules. Like Magnetic Layout, engravers and other detail-oriented types will want to understand the minutiae of the rules. Most users, however, will likely just want to know: Does it work? For the most part, the answer is yes. Again, I would liken it to Magnetic Layout. It doesn’t achieve perfect results all of the time, and there are some edge cases where further tweaking to the algorithm is called for. But if you’re starting a new score from scratch in Sibelius 8.1, you’ll generally get very good results with this feature. As was the case before, you can always override the position of a rest by manually moving it. Keep in mind, though, that if the feature is switched on, the default position of a rest (either by being left alone or by being reset by Appearance > Design and Position > Reset Position) will now be where Sibelius places it according to the new Engraving Rules. 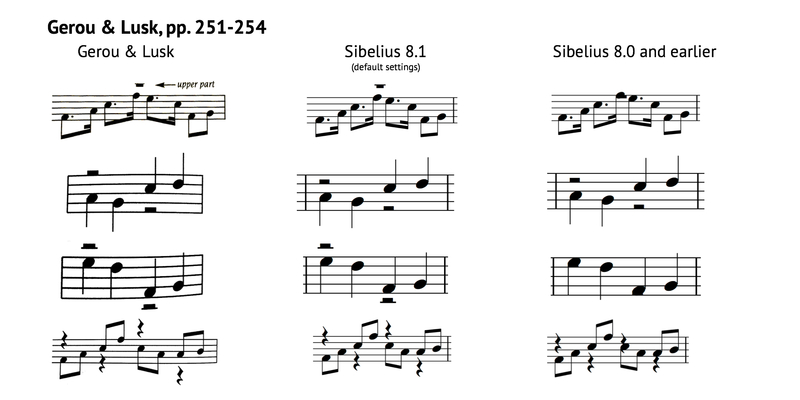 I consulted various engraving textbooks and was curious to see how Sibelius 8.1, with its default settings, replicated the notation examples compared to Sibelius 8.0 and earlier. The results were quite good, as you can see below — particularly on some of the more complicated examples. You’ll still need a couple of plug-ins to handle certain situations, like when rests of the same duration appear on the same beat. For that, Bob Zawalich’s Hide Duplicate Rests is the solution. Rests that appear in between beamed notes didn’t receive any special treatment in this update, either; Float Rests is the answer to that problem. It would be nice if Sibelius could automatically handle those cases. Still, the rest position feature in Sibelius 8.1 is a worthy accomplishment and marks the first real engraving improvement since Sibelius 7. A thorn in the side of many a Sibelius user was the strange position of first and second ending lines; according to the feedback site Ideascale, it was the top pet peeve. The ending line would continue onto the next bar; this was especially annoying on system breaks, where a vestigial piece of the line would appear, forcing the user to adjust it in Panaroma view. Thankfully, this has finally been addressed, and ending lines will appear with the correct endpoints by default when the bar(s) is selected and the appropriate line is chosen. Another oft-requested feature has been direct MP3 export of audio from Sibelius. Until now, users were limited to exporting audio playback in the default uncompressed file format for the operating system (WAV for PC and AIFF for Mac). These files are large, taking up lots of precious storage space and bandwidth, making them difficult to share easily. As a result, users wishing to convert the files to a compressed format such as MP3 needed a third-party program to do so (such as iTunes). The reason for the workaround was the license fees set by the patent-holders to the MP3 technology, which would have required Avid to absorb the licensing cost for each copy of Sibelius sold (or pass it along to the user). With some of the patents having expired, and the rest of them to do so by 2017, Avid has decided to absorb any short-term license cost and include MP3 encoding technology directly within Sibelius. You’ll find this new option in File > Export > Audio > Format, Size and Duration (previously it was just Size and Duration). Now, MP3 is an option for Format, along with either WAV or AIFF. If you choose Enable MP3 Surround Encoding, you’ll get a 6-channel 5.1 format instead of Sibelius’s 2-channel stereo format. The extra four surround channels are derived from the source stereo mix by adding a slight delay to each channel. MP3 decoders that do not support surround decoding treat the resulting MP3 as a standard 2-channel stereo MP3. The reason for this surprisingly fancy feature, according to Avid, is to satisfy a licensing requirement. As before, you can set the sample rate to either 48 kHz or 44.1 kHz. You’re also able to set a bit rate anywhere from 80 to 320 kps. A lower rate might be appropriate for, say, a ringtone, while a higher one would be for a polished demo. Most MP3s are encoded in the 128-192 kbps range; the default in Sibelius is 128 kbps. The higher the bit rate is, the larger the file size will be. Currently, MP3 exporting is not available to ManuScript, which means that any plug-in that exports audio will not be able to use the MP3 format. Avid has said that this capability will be added in the future. Mac laptop users will appreciate improvements made to the way two-finger scrolling and pinch zoom are handled. 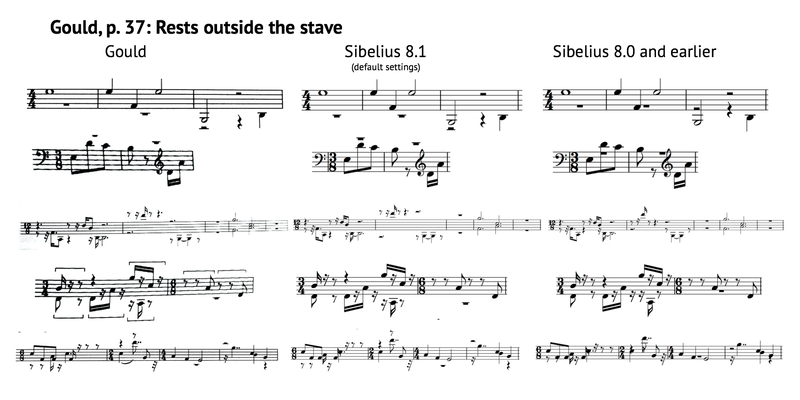 In particular, users of Sibelius 8.0.1 will be aware that scrolling on a Mac was troublesome. This is now fixed in Sibelius 8.1. Further, with 8.1, Sibelius is now officially supported on the latest Mac operating system. El Capitan introduced a new behavior to the green button where it behaved to put a window into OSX’s full screen mode (as opposed to stretching the window to the available size of the desktop). Unfortunately, this could occasionally cause Sibelius to crash. The fix is to revert the green button in Sibelius to the way it used to work in prior OSs. In the event of a crash, Sibelius now offers to upload a report to Avid’s servers to help in improving Sibelius’s stability. It uses Google’s BreakPad crash handling library, running as a separate process, to generate the report. If and when Sibelius crashes, BreakPad captures a stack trace from Sibelius and displays a dialog inviting the user to describe what the user was doing at the time of the crash, and uploads the report to Avid. 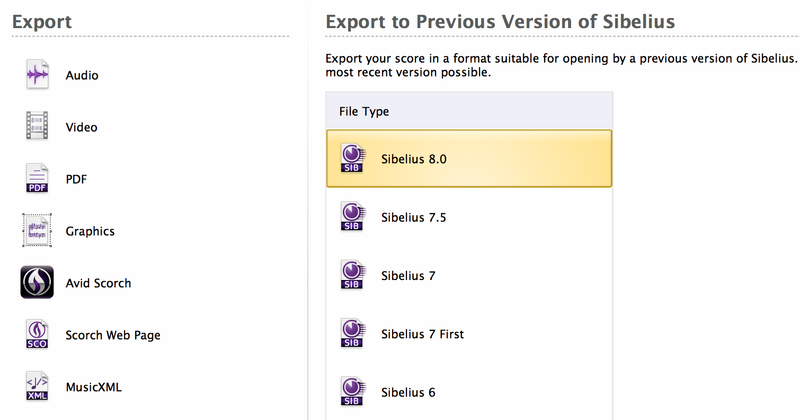 Sibelius 8.1 includes a number of other fixes. You can see the full list in the release notes. Sibelius 8.1 will overwrite any 8.x version you have on your computer, but will leave other versions intact, unless you tell the installer to uninstall those versions. You also have the separate option of copying supporting files from Sibelius 7.5, if you’re upgrading from that version. If you have Sibelius 8.0 or 8.0.1, you should upgrade to 8.1, and will be prompted to do so by the Application Manager. It’s free for most users of 8.x unless you bought a monthly subscription plan that has already expired. If the annotation and pen-and-touch features added in Sibelius 8.0 interest you, that would of course be a reason to upgrade as well, although nothing new has been added to those features in 8.1. In testing the 8.1 update, I found it to run slightly slower on my system than 7.5 (Late 2013 Mac Pro running Mac OS X Mavericks 10.9.5). I especially noticed it in navigating the File > Export menu and on some of the drop-down boxes in dialogs. Avid says that this is a known issue and will be fixed in a future update. Sibelius 8.1 introduces a new file format. Exporting to Sibelius 8.0 and earlier is offered via File > Export > Previous Version. So now we have separate file formats for 7, 7.5, 8, and 8.1. Hopefully, the file format won’t continue to change with each point release; otherwise collaborating with other users will be even more complicated than it already is. If the file format must change to accommodate new features, then I would suggest that recent previous versions be updated with some sort of capability to open later versions upon opening a file (perhaps by calling a converter in the cloud), rather than having to rely on the creator of the file to save it as a previous version. Users may recall that 8.0 files saved without any annotations were able to be opened in 7.5 without being converted first. This is no longer possible with 8.1; even a blank 8.1 file will not be able to be opened in an earlier version. 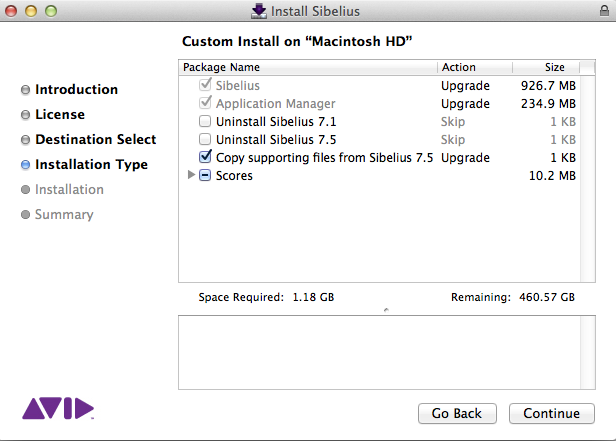 Sibelius 8.1 will run on any 64-bit system running Windows 7 or later or Mac OS 10.9 or later. Various purchase options, including subscriptions, perpetual licenses, and upgrades are available from Avid’s online store and other resellers such as Amazon and Sweetwater. Joe Pearson told me that he was now looking forward to getting user feedback from the new improvements, “especially since we’ve already started work on Sibelius 8.2,” and invited users to get in touch with him through the Sibelius forum or directly via e-mail me [email protected]. He also added that he and senior product manager Sam Butler will be demonstrating the new features at the Avid stand at NAMM at Hall A booth 6400 during the remainder of the show. Thanks for the detailed review, Philip! Sort of too bad about the version format change, but it is nice to see some new actual notation features, even if they are relatively modest (it is just a point release). I can see the rest avoidance stuff being useful. Thanks Philip — rests avoiding notes in another voice is a good improvement. Happy to see, first and foremost, that Sibelius is still being actively improved. We wanted to maintain the same backwards compatibility that Sibelius has always been good at, so we were forced to revise the file version. This allows the File tab > Export > Previous version process to freeze the newly positioned rests, such that they appear in the same position in older copies of Sibelius. I do however agree that it’s not going to be a scalable model if we continue adding features like this, so we’re working on some sort of solution that should make this more transparent in the future. Thanks for this review. The new features appear to me to be useful and relevant for most users. I think that continuing development which focuses on Sibelius as both a composition tool and an engraving tool is the only way to ensure its long term future. I am concerned, however, that many educational institutions, particularly schools, may be priced out of using Sibelius by the yearly subscription. It is often easier to get funding for a one off upgrade than to commit to long term funding in an uncertain financial climate. It is also unlikely that institutions will want to invest in an software license that they might lose ( or be unable to upgrade) if they cannot maintain the payments. Musescore is not quite so good, but it’s free….???? We do offer handsome discounts for our educational users, especially multi-seat licenses for schools and other establishments. I am particular to the ability to go straight to .mp3. Unfortunately, the update brought constant crashing when exporting to audio for me. I export my work at various tempi for practiced purposes and I am lucky to get two exports completed now without Sibelius crashing. I am using Sounds 7, Windows 10 and work from an SSD. Export seems a lot faster…when it works. Sorry to hear that! Have you tried the usual troubleshooting steps like updating your sound card drivers? Feel free to pop me an e-mail and I can ask one of our tech support team to get in touch. [email protected] . It may turn out that this is a bug that we could address in a future release too. Thanks Joe. I am in-between exports but in my attempts to solve the problem myself, I uninstalled Sibelius, downloaded a fresh copy and reinstalled it. The last couple of exports after that have worked properly. So we’ll see. Really useful time saver if it performs to spec. is it possible to buy an upgrade to sibelius 8.1?